Ireland history had been hugely impacted by the Vikings, but until the 1960ies nobody realised just how much. During the 1950ies it was believed that Dublin was built on a peat bog, and aside from the occasional discovery of Viking and medieval artifacts in construction work during the nineteenth century, there was no awareness of the extent of Viking remains that lay underneath the modern city. In 1961 the office of Public Works (OPW) was rebuilding a part of Dublin Castle when they stumbled upon a Viking structure when demolishing the existing walls. Beneath the Anglo-Norman walls of the castle lay the well preserved remains of a Viking town. 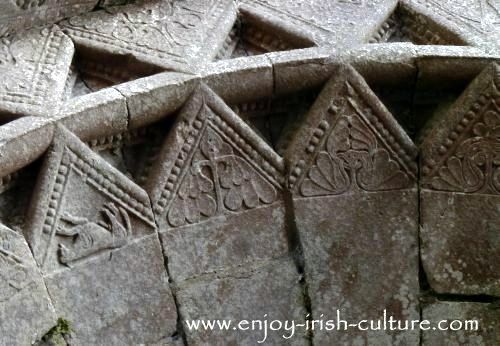 An example for how the presence of Vikings changed Ireland's history can be seen in the design of the Cathedral window at Annaghdown, County Galway, where animal motifs are used enriching very early Christian Irish art. There was an initial buzz of excitement in the media. The excavations were never completed, nor documented in any published report. The people of Ireland were left largely unaware of the importance of these finds. Archaeologists and historians were impressed however. They organised larger scale excavations at a different site on the corner of High Street and Nicholas Street which were carried out by the National Museum in 1962-63. It became apparent that instead of being built on a peat bog, Dublin was in fact erected upon packed layers of organic material, namely compressed vegetation, refuse laid down over many centuries of urban habitation. These layers turned out to be rich in objects and the largely intact remains of Viking and medieval buildings! Unfortunately, the planning authorities of the time thought little of these finds. What followed is one of the saddest episodes in terms of preservation of Irish heritage. In 1968 Dublin Corporation had acquired a large site at Woodquay in Dublin. Prompted by the earlier discoveries, excavations were carried out by the Museum in 1969. In 1974 Pat Wallace and his team working on the large scale excavation discovered a well- preserved Viking town. The best remains of a Viking town anywhere in Ireland or indeed in Western Europe! The foundations and some of the walls of buildings had remained intact, due to the waterlogged nature of the site. The town was so well preserved that some of the Viking matting materials woven from reeds had remained a green colour. The post and wattle walls of many of the houses had survived intact along with the original stone city wall, the oldest wall in Dublin City. Objects found included domestic vessels made of wood and clay, combs fashioned from bone and antlers, leather material from a cobblers workshop, and a vast number of metal objects. The finds shed light on the day to day life in Viking Dublin, revealing the skills of the tradesmen and artisans of the time. Read related articles here about the Vikings arriving to Ireland, about how the Vikings settled here and about Viking contributions to Irish culture. There was so much precious information to be gathered here. The public now became aware of the importance of the site. But despite huge public opposition, protest marches and an occupation of the site, the development planned by Dublin Corporation eventually went ahead. Colm’s parents took part in these protests back in the day. But no alternatives were explored by Dublin Corporation as to how the site could have been preserved. 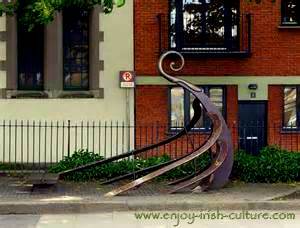 There was no regard for Viking culture, which was discovered to be an intrinsic part of Irish culture and heritage. The uncovered artifacts are today stored in the National Museum. The museum boasts the largest collection of Viking swords outside Scandinavia. However, we can be sure that countless artifacts were left in the ground and destroyed when the site was bulldozed. Today, the site is occupied by the concrete monstrosities of the Dublin Civic Offices. One wonders what the site might look like today, had the effort been made to preserve it. We might have the Number One Viking tourist attraction in Western Europe. By the way, it would be naive to assume that such cultural vandalism of the remnants of Ireland's history could not reoccur today. Just think about the plans for a motorway running close to the Hill of Tara, Ireland's precious ancient site, and how the loss of all that heritage will impact on our Irish culture. We hope you got a lot out of this Ireland history article about the Vikings in Dublin. We love researching Irish history topics! Please kindly pay it back and let the world know about us. Use the social functions provided at the top left and at the bottom of the page- it will only take a few seconds of your time and is much appreciated.